12-cue firing receiver (module). For use with our P series of firing systems (P12, P1200). Uses 2 9V batteries. 12-cue wireless firing system. 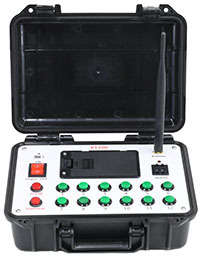 Comes with a plastic case, A23 battery (for remote), 12-button remote, 1 testing LED and 3 firing modules (4 cues on each). Requires 12 AA batteries (4 per module). Comes with the best warranty on the market (1-year). 100% compatible with the P1200 Control Desk and R4 remote. Max range: 450 feet. BONUS: we will include 12 AA Duracell Procell batteries (while supplies last). Wireless P1200 Control Desk for up to 1,200 unique cues. For use with the P4 firing module. Requires 6 AA batteries. Max range is 900 feet. We recommend watching the video for more details on this system. This compatible with the P4, R4, P12 firing equipment. 1-year warranty. This is not compatible with the MS series of firing systems. BONUS: Comes with a dual lamp clip-on 4 LED light (while supplies last) so you can see the buttons while firing your show! 3 AAA batteries required for light. Wireless 4-cue firing module. For use with the P1200 (control desk), P12 or R4 firing system. Requires 4 AA batteries. Can be used with Red Dragon, Talon igniters or e-matches. LED for each cue. Green is ready (continuity), Red is fired or no continuity. Please note: The fire-all and sequence option has been disabled on this unit. You can still program all cues to fire at the same time. (please contact us if you have questions). Wireless 4-cue firing system with remote. Excellent starter system to get your feet into wireless firing. Remote requires an A23 battery (not included). Maximum range is 300 feet. The module is compatible with the P1200 and P12 firing systems. 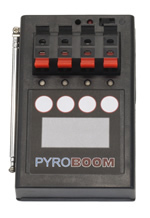 Don't waste your valuable igniters testing cues on your firing systems! These LEDs are forever reusable and will accurately test if your system is working correctly. They are great for checking sequences, or just plain making sure the system works correctly. Just plug them into your firing system as if they were a Red Dragon or e-match. NOTE: These do not work on a Cobra system.